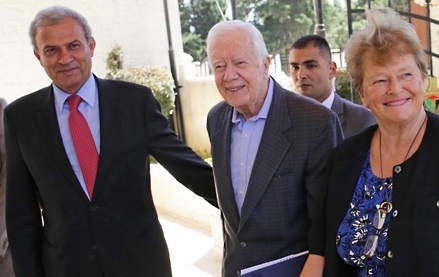 Former President Jimmy Carter, and former Norwegian Prime Minister Gro Harlem Brundtland, met with Palestinian Deputy Prime Minister Ziad Abu Amir, Thursday, at the Council of Ministers in Ramallah. During the meeting, Carter and Brundtland discussed with Dr Abu Amir, “matters concerning Palestinian reconciliation”. On Wednesday of this week, the Palestinian news agency Ma’an, reported that Carter’s previously planned Thursday visit to Gaza was “removed” from his itinerary “without reason”. Absent any official explanation, speculation is rampant as to what led to the cancellation, raising the question, why was Carter’s Gaza meeting cancelled and what prompted the cancellation? The Elders’ site earlier reported that Carter and Brundtland came to Israel/Palestine directly from a successful Elders’ delegation visit to Moscow where six members of The Elders, led by Elders’ Chair, Kofi Annan, concluded a successful visit which included a two-hour meeting with the six Elders and Russian President Vladimir Putin. After their arrival in Jerusalem, Carter and Brundtland hosted a roundtable to discuss “approaches to solving a broad range of issues facing the region”. The return trip to the Middle East is intended to “support the two-state solution and highlight Gaza’s humanitarian crisis”. The roundtable included Katleen Maes from the United Nations OCHA* (see below), who talked of “a humanitarian overview”; Nathan Thrall from ICG*, who discussed Fatah-Hamas and GNC political dynamics; Tania Hari from Gisha*, on Israeli policy towards Gaza; and Lani Frerichs who talked about policy tools for greater accountability. Carter’s trip to Gaza was to have been the first stop of the three-day Elders’ visit to Palestine and Israel. Ma’an describes the curent Elders’ visit to the Middle as one designed “to address pressing political issues and bring international attention to the current humanitarian crisis in the Gaza Strip”. Earlier in April, a PA government delegation from Ramallah held meetings in Gaza with Hamas officials, seeking answers to troublesome issues, including salaries to government employees. That meeting failed to resolve any substantial problems. Rivlin’s refusal to meet with Carter on this trip, according to the Jerusalem Post, followed a recommendation from the Israeli Foreign Ministry that Rivlin not meet with Carter, “in order to convey the message that those who harm Israel will not meet with the [Israeli] president. Over the decades since he left office as U.S. President in 1980, Carter has met frequently with leaders on both sides in international conflicts. The Elders have an intense interest in bringing peace to this region. 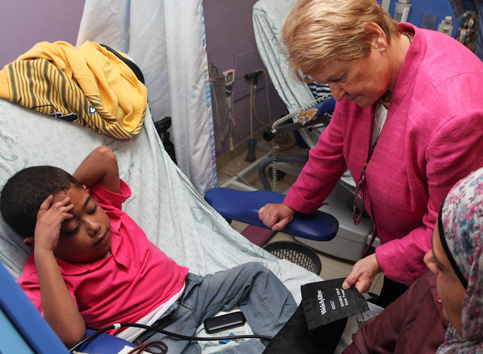 In October, 2012, former Prime Minister Brundtland visited a hospital in East Jerusalem which also treats patients from Gaza and the West Bank. (right). Carter’s schedule this week was to have included a meeting with Hamas leader Ismail Haniyeh “to discuss national reconciliation”, according to Hamas leader Ahmad Yousef. Under an accusatory headline, PA Sought Cancellation of Carter’s Visit to Gaza, the Middle East Memo points to a Palestinian news outlet, Quds Presse, which quotes a “well informed Palestinian source” who claims the Palestinian Authority had sought the cancellation. A well informed Palestinian source said yesterday that the Palestinian Authority (PA) had sought the cancellation of the former US President Jimmy Carter’s visit to the Gaza Strip. Quds Press reported. Since the source, Quds Press, is known to be affiliated with Hamas, it is possible that a faction within Hamas wants to accuse the PA of scuttling Carter’s trip, in order to further hamper the unity talks. Further reports on why Carter’s visit to Gaza was either cancelled or simply postponed, could emerge during the remaining Elders’ visits in Israel and the West Bank. As usual in such situations, finding the answers to why and who wanted to keep Carter from Gaza, we must begin by asking who benefits from the failure of the Palestinian Hamas-Fatah unity talks, and who possesses the clout to influence the cancellation. That could mean the usual suspect, the Israelis, or a faction within one of the two Palestinian parties involved. Or it could be an outside force seeking to keep this conflict alive. With Israel continuing to control Gaza’s borders, it is difficult to imagine any force other than Israel with the ability to bar Carter from Gaza. Meanwhile an Elders’ delegation remains in the region. It is expected to return to Ramallah Saturday, May 2, to meet with Palestinian President Abbas. The picture above from Ramallah is from the Elders’ website. The picture from a hospital in East Jerusalem is from the Middle East Memo site. *OCHA is the part of the United Nations Secretariat responsible for bringing together humanitarian actors to ensure a coherent response to emergencies. OCHA also ensures there is a framework within which each actor can contribute to the overall response effort. *The International Crisis Group ICG is an independent, non-profit, non-governmental organisation committed to preventing and resolving deadly conflict. *Gisha was founded in 2005 and is based in Tel Aviv. Gisha aims “to protect the freedom of movement of Palestinians, especially Gaza residents”. 8 Responses to Why Was Carter’s Gaza Meeting Cancelled? Thank you, Jim, for alerting many of us to President Carter’s visit to Palestine-Israel and his attempt to revive the 2-State Solution and help bring the 2 major Palestinian parties – the PA and Hamas – together. Israel invaded Gaza in July of 2014 and slaughtered 2,200 Palestinians, mostly civilians, in order to punish them for their attempt to unite the PA and Hamas in one unitary government. Israel fears that such a unity will allow the Palestinians to stop its colonization of Palestine. Israel will continue its aggressive mission because its goal is to continue occupying East Jerusalem, West Bank, and Gaza. Its obvious goal, in fact, is to annex the entire occupied Territories. They figure that the Zionist-infested Republican junta will help them towards this end in less than a couple of years. Let’s hope that President Carter and Norwegian Brundtland succeed in their efforts very soon. He should have insisted on going, even if just to remind people of the never ending, sadistic blockade of Gaza. The ‘sadistic’ blockade of Gaza is perpetrated by the same Zionism which tried to sink the USS Liberty and killed 38 American Navy men in the process in June 1967. I guess we will know the truth once he gets back home. But none of this makes sense any way. Americans who have worked tirelessly for peace between Israel and Palestine are discouraged and offended by the refusal of Israel’s President Rivlin to meet with Jimmy Carter. Alongside the way Prime Minister Netanyahu ignored diplomatic protocol and plotted against President Obama, these official actions are tantamount to turning their back on their best friends in the world and faithful supporters in the UN. There is simply no excuse for such behavior. Once more the flea wags the dog and not the tail.